How to I schedule my first ALTRD order? After selecting the alterations you want, you will be prompted to schedule your first pickup on our website. You can prep your clothes yourself! Send us an item to match, place pins too indicate fit, or simply describe what you want - any of these methods are fast, easy, and all our tailors need. We pick up on Mondays and Wednesdays from 12-2 PM or 7:30-9:30 PM. Please ensure that you leave your order with your doorman or office mailroom or that you are available at home during your pickup slot. If you have any difficulties, please email us at altrd@altrd.io. Our team is always happy to help! What can I expect to happen on my first ALTRD order? You don't have to be home when we pick up or drop-off if you can leave your order with your doorman (residential or office) or if we can access your building. If you live in a walk-up, we ask that you (or a roommate) are home so we can coordinate to pick up your order. How do your tailors know what adjustments to make? Our SewExperts don’t need to be in-person to be effective. Simply choose one of our prep methods - safety pin, match, or detailed description - and we’ll take care of the rest. I don’t get it - am I supposed to measure myself? What is a prep method? Our 3 prep methods have been tested countless times. The best part? These simple prep methods allow you to make adjustments quickly and easily. And they work! Keep reading for a few tips that will ensure accuracy. How do I prep my clothes with safety pin? How do I prep my clothes if I send in a match? If you send a match, you will be prompted for the following information: (1) which piece you want altered; (2) which piece is the match; and (3) a description of what you’re looking for. Describe Desired Alterations: Please take in sides of Altrd item to be the same as Match item. How do I prep my clothes if I want to do a detailed description? Please be specific. This option should be used for the simplest of alterations (i.e., hem my pants up 2 inches). Yes! All of our SewExperts have gone through rigorous skill assessments. Many of them worked as professional tailors or in garment factories before moving to the U.S.
How do I know your SewExperts won’t mess up my clothes? Each of our tailors has to meet high quality standards - we only work with individuals who are skilled and dedicated to excellence. And, after each order, our team checks each piece to ensure it passes requirements. Check out our Guarantee page as well. How did you find your SewExperts? When we began sharing our mission with our communities, we were overwhelmed by the inbound interest - so many skilled women are looking for a way to supplement family income but are not comfortable or cannot work outside the home. ALTRD helps fill a gap in the employment market by bringing the work to them. I like when the tailor at the dry cleaner irons my clothes. Will you do that? Definitely - your clothes will be returned to you neatly pressed. Nope! We don’t have a minimum order size but customers can enjoy free pickup and delivery for orders above $35. Your prices seem kind of expensive. Why? Our prices are in line with the tailoring service offered at local dry cleaners. And, while these establishments usually take a big cut for themselves, we’re passing on the majority of earnings to our SewExperts. Right now, ALTRD services are only offered in Manhattan but we hope to expand to other boroughs and cities soon! What if I don’t like the work done on my order? Your satisfaction is our priority! We know that your clothes matter and we appreciate your trust. Our process is centered on quality and we work tirelessly to ensure that your clothes are altered perfectly every time. If you are unsatisfied for any reason, just let us know and we’ll make it right. We re-alter any item for free. Check out our Guarantee page for more details. We’ll return your pieces to you in no more than 7 to 10 days. Expedited service will be a future offering. What does cuff/differentiated finish mean? A cuff or differentiated finish on a pant or sleeve means something other than the standard. This might mean a cuff, slit, vent, fray, or anything else that isn't a standard straight finish. When we're shortening your pants or sleeves, we want to make sure we do exactly what you want so if you want to keep the original hem on your jeans or the cuff on your sleeve, select the 'Cuff or Differentiated Finish' option. I don’t see the service I want on your website. Why? We continue to build out our offering to meet customer needs while ensuring that we can maintain quality. If you don’t see something you need, let us know! You can always reach us at altrd@altrd.io. 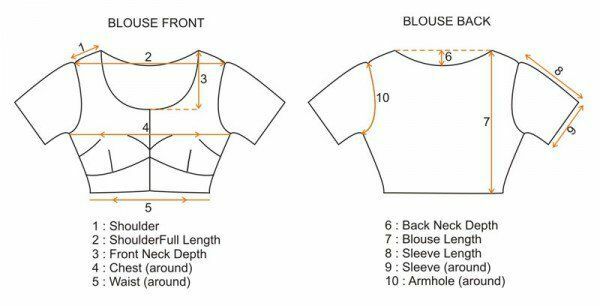 What happens if you cannot complete the clothes or alteration that I need? This is rare, but if it happens, we will call you shortly after your order is placed to discuss options. Why not? Let ALTRD take care of your South Asian attire needs! I need a sari blouse. Where can I get the material for it? We would be happy to create a sari blouse for you! Measurements: The photo below shows the measurements we need, which you can include in the Detailed Description or you can send in a sari blouse to match.